Why did Diane Hazzard give birth to six out-of-wedlock children, though her brothers and mother had died in their 30s of alcoholism? "The more I had," she explains, "the more I thought I would be loved, to fill that empty space in my heart. But it always don't turn out that way." Jennifer Dworkin's remarkable, five years-in-the-making documentary, Love & Diane stands tall as a true-life, multi-child Ma Joad tale. Diane, a stout, Bible-swearing matriarch, strives to keep her dumped-on, oft-defeated family together, assuring them that things will just get have to get better, in the face of gloomy poverty, unemployment without end, and an American system which seems out to foil them. The Hazzards, an African-American welfare family stuck in East New York, a slum section of Brooklyn, start off the film even more miserably than the the Joad clan of Steinbeck's The Grapes of Wrath. The Joads had roots, a home and land back in Oklahoma, but the Hazzards have been moving from squalid rental unit to rental unit for decades, through several have-not generations. In Steinbeck, Ma Joad was practically beatified, always a devoted, charitable mother who is worshipped by all her flock. In sharp contrast, Diane Hazzard's formidable task is earning the respect and affection of her psychologically bruised, deeply angry children. In earlier days, she was a desperate crack addict whose kids were all shipped off to Dickensian group homes while she got high. "Crack makes you heartless, cold," she says. Instead of mother-adoring Tom Joad, Diane's two sons are tragic, family-alienated lost causes. Charles, the oldest, is already dead when the movie begins, a teen suicide. 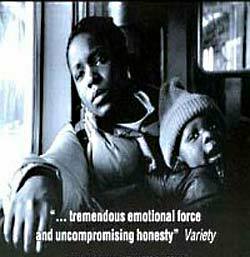 Her other son, Willie, another teenager, is a sulking phantom figure who walks through, then leaps out of, the documentary, running away from living with his mom, choosing the precarious life on the streets. And yet, and yet, there's also possibility. Three of Diane's daughters seem to have made a shaky peace with their mom, taking Diane at her word that, cured of that crack habit and with Jesus's help, she has genuinely changed. She's a caring mother now. And then there's the baby Donyaeh, Diane's beautiful cuddly, adorable grandchild, whose birth comes at the beginning of Love & Diane. In The Grapes of Wrath, Rosasharn's infant arrives stillborn. In Love & Diane, Donyaeh is the great hope, and things seem to be moving onward and upward when Donyaeh's hospital tests show him to be AIDS negative. So what's the rub? It's Donyaeh's mom, Love, the other half of the documentary's title. This 19-year-old single parent, who is AIDS-positive and sometimes medically depressed, has never recovered her equilibrium, or her sense of self, after what she calls her "six years in hell," in a group home. She can't forgive Diane for putting her there, and even now she accuses her mom of not caring. Love seethes with jealousy when grandma seems too attentive to baby Donyeah. She has what she calls "rage issues." Through most of Love & Diane's tense, absorbing two hours and twenty minutes, Diane struggles to get Love to drop her animosity. "I cannot make up for the past," she pleads. "You've got to stop blaming me for your life." But Love is most times a stubborn victim, and her screwed-up existence is almost a self-fulfilling prophecy. A hot-headed incident leads to Donyeah, whom she truly adores, being taken from her and placed in a foster home. There's so much drama, all of it real. Will Love get her child back? How will Donyeah's devoted foster mother react to giving up the child she is raising? Will Donyeah, passed hand to hand, remain happy as a toddler? Will Love and Diane reconcile? And another fascinating thread: can Diane find honorable employ and, presumably, break the chain of welfare holding back the Hazzard clan? You've got to see the movie if you want answers. And what about those in the audience who might denounce Love & Diane as politically incorrect, a documentary in which a white filmmaker, Dworkin, stereotypes black people as on the dole, residing in government-subsidized apartments? Interestingly, race is never mentioned in the film by anyone. The Hazzards are undeniably African-American, but they stand in for any American family living below the poverty line, just as did the white Joads. And the dense, complex, humanist storytelling leaves stereotyping in the dust. The Hazzards live hard on screen, and those who see Love & Diane will be caring for them, rooting them on.